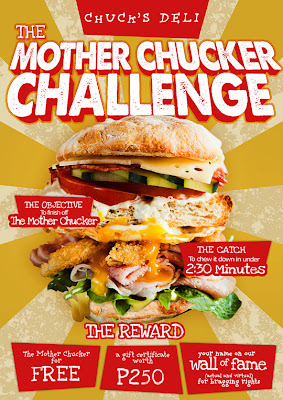 The Food Alphabet and More: The Mother Chucker Challenge at Chuck's Deli - starts today April 12! 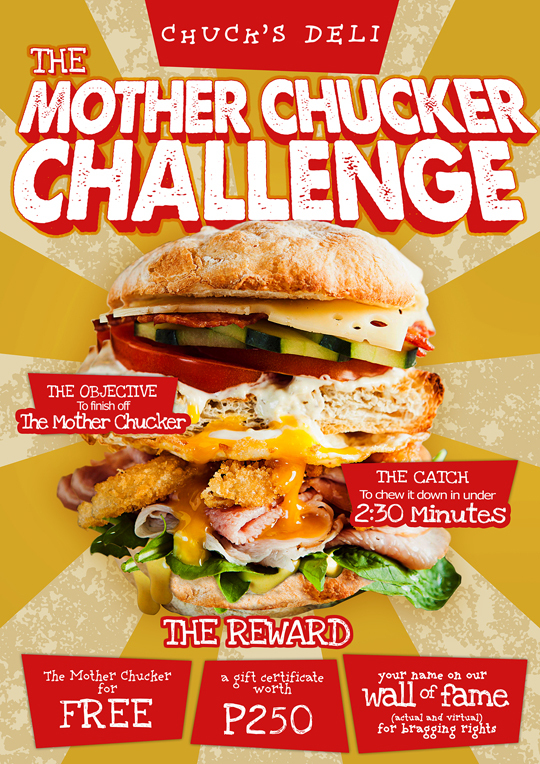 The Mother Chucker Challenge at Chuck's Deli - starts today April 12! Finish a Mother Chucker and reap the rewards! Starting today April 12, 2013 Friday! Rush to Chuck's Deli, my favorite slabwich place in the metro and take on the Mother Chucker Challenge. Finish the Mother Chucker in 2 and a half minutes and get to reap the rewards! What's in it for you? Get to munch down the Mother Chucker worth P295 for FREE, a GC worth P250 to use on your next visit and of course bragging rights on the Wall of Fame at Chuck's Deli. So head on and take that challenge!